1786 ~ 1808: born in Ôsaka. He starts his career as a disciple of Ichikawa Jinnosuke, who gives him the name of Ichikawa Kumatarô and lets him play in his troupe of children actors (Kodomo Shibai). 7th lunar month of 1808: his master Ichikawa Jinnosuke dies. Fall 1812: he becomes disciple of the Kamigata star Nakamura Utaemon III. 11th lunar month of 1812: he receives the name of Nakamura Sankô I at the Naka no Shibai, playing the role of Konami in the classic "Kanadehon Chûshingura". 9th lunar month of 1813: Sankô plays for the first time the role of the courtesan Akoya in the drama "Dan no Ura Kabuto Gunki", which is performed in Ôsaka at the Kado no Shibai; his stage partners in the roles of Shigetada and Iwanaga Saemon are Nakayama Hyakka and Nakamura Utaemon III. 11th lunar month of 1813: he settles in Edo and takes the name of Nakamura Matsue III at the Nakamuraza, playing 3 roles in the drama "Okudôsha Bandô Junrei". 9th lunar month of 1814: Matsue plays in the same theater the role of the courtesan Akoya in the drama "Dan no Ura Kabuto Gunki"; his stage partners in the roles of Shigetada and Iwanaga Saemon are Bandô Mitsugorô III and Nakamura Utaemon III. 1st lunar month of 1816: premiere at the Nakamuraza of the new year sogamono "Hiyoku no Chô Haru no Soga Giku". This new year drama mixed two sekai: it was a sogamono and a gonpachi-komurasakimono. The sogamono fell into oblivion and the gonpachi-komurasakimono was staged independently under the title "Sono Kouta Yume mo Yoshiwara" ("Gonge" and "Gonjô"); Matsue plays the roles of Princess Maizuru, Tsukisayo, Chôbê's nyôbô and Kashiku [more details]. 1816: Matsue goes back to Kamigata and performs at the Kitagawa no Shibai in Kyôto. 1st lunar month of 1819: Matsue plays at the Kado no Shibai the role of the courtesan Akoya in the drama "Dan no Ura Kabuto Gunki"; his stage partners in the roles of Shigetada and Iwanaga Saemon are Ichikawa Ebijûrô I and Asao Kuzaemon I. 3rd lunar month of 1821: premiere at the Kado no Shibai of the drama "Kajiwara Heizô Kôbai Tazuna", a new version of the third act of "Miura no Ôsuke Ôbai Tazuna", revised by Kanazawa Ryûgoku I; Matsue plays the role of Kozue [casting]. He also plays the role of Hinadori in the drama "Imoseyma Onna Teikin"; his stage partners are Arashi Koroku IV (Omiwa, Koganosuke), Bandô Mitsugorô III (Daihanji, Iruka, Fujiwara no Tankai) and Nakamura Utaemon III (Fukashichi, Sadaka). 5th lunar month of 1821: Matsue plays in the same theater the roles of Kaoyo and Okita in the drama "Taiheiki Chûshin Kôshaku". 7th lunar month of 1821: Matsue moves to the Naka no Shibai, playing the role of Masaoka in the play "Hagi ha Sendai Na ha Matsumoto", whose plot and characters belong to the "Meiboku Sendai Hagi" world. 9th lunar month of 1821: Matsue is back at the Kado no Shibai, playing in the drama "Taiheiki Kikusui no Maki" but the performance is not a success because of a quarrel between Nakamura Utaemon III and Ichikawa Danzô V.
11th lunar month of 1821: he takes back the name of Nakamura Sankô I at the Naka no Shibai, where he plays the roles of Saemon's okugata and the nakai Ofune in the drama "Sanjukkoku Yobune no Hajimari". Fall 1822: Sankô goes to Edo. 11th lunar month of 1822: Sankô performs at the Nakamuraza in the drama "Gohiiki Azuma Hyakkan", which celebrates the shûmei of Mimasu Gennosuke I and Sakata Hangorô IV; his stage partners are Matsumoto Kôshirô V, Bandô Mitsugorô III, Iwai Kumesaburô II, Arashi Kanjûrô I and Yamashina Jinkichi III. 1st lunar month of 1823: he takes the name of Nakamura Matsue, using a different way to write Matsue. 3rd lunar month of 1823: Matsue plays the role of Masaoka in the drama "Kaeri Kuruwa Hana no Date Zome", whose plot and characters belong to the "Meiboku Sendai Hagi" world and which is staged at the Nakamuraza. Fall 1823: Matsue goes back to Kamigata. 11th lunar month of 1823: he takes back the name of Nakamura Matsue III and triumphes at the Kitagawa no Shibai in Kyôto by playing the roles of Oritsu and Omatsu in the drama "Keisei Chigo no Fuchi". He also plays the role of the courtesan Akoya in the drama "Dan no Ura Kabuto Gunki", sharing the stage with the stars Ichikawa Ebijûrô I (Shigetada) and Nakamura Utaemon III (Iwanaga Saemon). 1st lunar month of 1824: he takes back the name of Nakamura Sankô I. Spring 1825: he takes back the name of Nakamura Matsue III. 1st lunar month of 1827: Matsue's rank in the Kamigata hyôbanki, wakaonnagata section, is jô-jô-kichi (superior - superior - excellent). He is with Sawamura Kunitarô II the kanjiku for the onnagata actors. 5th lunar month of 1827: Matsue plays for the first time the role of Osono in the drama "Hikosan Gongen Chikai no Sukedachi", which is performed at the Kita-Horie Ichi-no-Gawa Shibai in Ôsaka. His stage partner in the role of Rokusuke is Seki Sanjûrô II. The same play is performed with the same casting in the 6th lunar month at the Kita-Shinchi no Shibai. 7th lunar month of 1827: Matsue plays the roles of Miyako and Ohaya in the drama "Futatsu Chôchô Kuruwa Nikki", which is performed at the Kado no Shibai. 6th lunar month of 1828: tour in Miyajima. Matsue plays among others the prestigious role of the courtesan Akoya in the drama "Dan no Ura Kabuto Gunki". 9th lunar month of 1829: Matsue plays the role of Otoku in Chikamatsu Monzaemon's drama "Keisei Hangonkô", which is produced at the Kado no Shibai by the zamoto Nakamura Umematsu. His stage partners are Nakamura Utaemon III (Matahei), Arashi Rikan II (Utanosuke) and Kataoka Nizaemon VII (Shôgen). The same play is performed with the same casting in November at the Kitagawa no Shibai in Kyôto. 3rd lunar month of 1830: At the beginning of the month, Matsue plays the roles of Osono, Tonase and Okaru in the classic "Kanadehon Chûshingura", which is performed in Ôsaka at the Kado no Shibai. He also plays the role of the courtesan Agemaki in the drama "Sukeroku Yukari no Edo Zakura". His stage partners in the roles of Sukeroku and Soga Jûrô are Ichikawa Hakuen II and Nakamura Utaemon III. In the middle of March, Matsue plays the roles of Ohatsu and Okon in the dramas "Kagamiyama Gonichi no Omokage" and "Ise Ondo Koi no Netaba". He also performs the main role of the dance "Keisei Dôjôji", which commemorates the first anniversary of the death of Nakamura Noshio II and belongs to the "Musume Dôjôji" world, a role popularized by Nakamura Tomijûrô I. 4th lunar month of 1830: Matsue plays 2 roles in the same theater in the drama "Ôtô-no-Miya Asahi no Yoroi". 6th lunar month of 1830: tour in Miyajima in the company of Nakamura Utaemon III. They perform in "Hirakana Seisuiki". 11th lunar month of 1830: Matsue plays the roles of Yae, Tonami and Kakuju in the classic "Sugawara Denju Tenarai Kagami", which is performed in Kyôto at the Kitagawa no Shibai. He also plays the role of Osato in the "Sushiya" scene of the play "Yoshitsune Senbon Zakura". 1st lunar month of 1831: Matsue is back in Ôsaka, playing 3 roles in the drama "Keisei Shigeshige Yawa", produced by Nakamura Baika I at the Naka no Shibai. 3rd lunar month of 1831: the troupe performing at the Naka no Shibai moves to the Kado no Shibai. Matsue plays the roles of Shinobu and Okoma in the dramas "Onna Setsuyô Emon Kagami" and "Koi Musume Mukashi Hachijô". 5th lunar month of 1831: Matsue plays in the same theater the role of Itotaki in the drama "Musume Kagekiyo". The role of Kagekiyo is played by Nakamura Utaemon III. 7th lunar month of 1831: the troupe performing at the Kado no Shibai moves to the Naka no Shibai. Matsue plays the roles of the Kiku-no-Mae and Sagami in the drama "Ichi-no-Tani Futaba Gunki". He also plays the role of the courtesan Umegawa in "Koi Bikyaku Yamato Ôrai", sharing the stage with Nakamura Utaemon III in the role of Kameya Chûbê. 9th lunar month of 1831: Matsue plays in the same theater the role of Namiji in the drama "Takane no Nami". 11th lunar month of 1831: Matsue, following his master and his troupe, moves to Kyôto, performing for the Kitagawa no Shibai kaomise program. He plays the roles of Okaru, Tonase and Osono in the classic "Kanadehon Chûshingura". 1st lunar month of 1832: Matsue, Utaemon and his troupe are back in Ôsaka, playing in the drama "Keisei Hana no Yamazaki", which is produced by Nakamura Tamanosuke II at the Naka no Shibai. 2nd lunar month of 1832: the troupe moves to the Kado no Shibai. Matsue plays the role of Omiwa in the drama "Imoseyama Onna Teikin", which is produced by Sawamura Montarô. 9th lunar month of 1832: Matsue plays in the same theater the role of Shigenoi in the drama "Koi Nyôbô Somewake Tazuna". 11th lunar month of 1832: Matsue takes part in the kaomise program of the Kado no Shibai, playing in the dramas "Nichiren Shônin Minori no Umi" and "Suda no Haru Geisha Katagi" and the dance "Tokiwa Akizuki no Aki", which are produced by Nakamura Umematsu. 1st lunar month of 1833: Nakamura Matsue III takes the prestigious name of Nakamura Tomijûrô II, which has not been held since 8th lunar month of 1786, at the Kado no Shibai, playing in the new year drama "Keisei Chigo-ga-Fuchi". This is also the premiere of "Chichi Morai", staged as the second part of "Keisei Chigo-ga-Fuchi", in which Tomijûrô plays the role of Koyuki [casting]. 2nd lunar month of 1833: tour in the province of Bizen. 3rd lunar month of 1833: Tomijûrô is back in Kyôto and plays the roles of Sadaka and Omiwa in the drama "Imoseyama Onna Teikin", which is staged at the Kitagawa no Shibai. Premiere at the Kitagawa no Shibai of "Hana Fubuki Koi no Tekagami", in which Tomijûrô plays the role of Koyuki [casting]. 5th lunar month of 1833: Tomijûrô is back in Ôsaka and plays the role of Kinshôjo in Chikamatsu Monzaemon's drama "Kokusen'ya Gassen", which is produced by Nakamura Tamanosuke at the Kado no Shibai. The role of Watônai is played by Arashi Rikan II. 7th lunar month of 1833: Tomijûrô moves to Kyôto, performing in the drama "Kokusen'ya Gassen" and "Gokusaishiki Musume Ôgi", which are staged at the Kitagawa no Shibai. 12th lunar month of 1833: Tomijûrô is back in Ôsaka, playing the role of Sagami in the drama "Ichi-no-Tani Futaba Gunki", which is produced by Nakamura Tsurunosuke at the Kado no Shibai. 1st lunar month of 1834: his rank in the Kamigata hyôbanki is dai-jô-jô-kichi (grand - superior - superior - excellent). 3rd lunar month of 1834: Tomijûrô plays the role of princess Taema in the drama "Narukami Zakura", produced by Nakamura Tsurunosuke at the Kado no Shibai. The role of the wicked priest Narukami is played by Ichikawa Ebizô V.
10th lunar month of 1834: Tomijûrô plays the role of Otoku in Chikamatsu Monzaemon's drama "Keisei Hangonkô", which is performed in the same theater. The role of Matahei, Otoku's husband, is played by Nakamura Shikan II. 11th lunar month of 1834: Tomijûrô stays a few weeks in Kyôto, participating in the kaomise of the Kitagawa no Shibai. He plays the role of Sagami in the "Kumagai Jin'ya" scene of the classic "Ichi-no-Tani Futaba Gunki". He also plays the role of Sekijo, Gotobê's wife, in "Yoshitsune Koshigoejô". The role of Gotobê is played by Nakamura Utaemon III. 1st lunar month of 1835: Tomijûrô plays in Ôsaka in the drama "Keisei Iriai Zakura", which is produced by Nakamura Tsurunosuke at the Kado no Shibai. This is also the premiere of the dance "Wake Futatsu Ninin Dôjôji", which stars Tomijûrô and Nakamura Shikan II. 4th lunar month of 1835: Tomijûrô moves to the Naka no Shibai, playing the role of Okon in the drama "Ise Ondo Koi no Netaba". His stage partner in the role of Fukuoka Mitsugi is Nakamura Shikan II. 6th lunar month of 1835: Tomijûrô and Nakamura Shikan II settle in Kyôto. 9th lunar month of 1835: Tomijûrô plays the roles of Ohaya, Oyasu and Oseki in the dramas "Hikimado", "Hime Komatsu Ne-no-Hi no Asobi" and "Kiyomizu Seigen", which are performed at the Kitagawa no Shibai. 1st lunar month of 1836: premiere at the Naka no Shibai of Nishizawa Ippô's drama "Hana no Ani Tsubomi no Yatsufusa" Tomijûrô plays the roles of Princess Fuse and Hamaji [casting]. 8th lunar month of 1836: Tomijûrô plays 2 roles in the drama "Yorimasa Nue Monogatari", which is performed in the same theater. He also plays the role of the courtesan Fujiya Azuma in the drama "Abura Uri Kuruwa Banashi". 10th lunar month of 1836: Tomijûrô plays in the dramas "Mai Ôgi" and "Gosho Zakura Horikawa no Youchi", which are performed at the Kita-Shinchi no Shibai in Ôsaka. 2nd lunar month of 1837: Tomijûrô plays the roles of Shigenoi, Osan and Koman in the drama "Keisei Tamate Zuna", which is produced by Nakamura Umetarô at the Naka no Shibai. 7th lunar month of 1837: Tomijûrô plays the roles of Sadaka and Omiwa in the classic "Imoseyama Onna Teikin", which is produced by Arashi Kitsuzô at the Kita-Horie Ichi-no-Gawa Shibai. 8th lunar month of 1837: Tomijûrô plays the role of Princess Toki in the drama "Kamakura Sandaiki", which is performed at the Kita-Shinchi no Shibai. 9th lunar month of 1837: Tomijûrô plays the role of Princess Minazuru in the classic "Kiichi Hôgen Sanryaku no Maki", which is performed at the Naka no Shibai. 11th lunar month of 1837: Tomijûrô takes part in the kaomise of the Minamigawa no Shibai in Kyôto. He plays the roles of Masaoka and the courtesan Takao in the drama "Meiboku Sendai Hagi". 1st lunar month of 1838: Tomijûrô is back in Ôsaka, playing in the drama "Keisei Sato no Funauta", which is staged at the Kado no Shibai and celebrates the shûmei of Nakayama Ittoku III and Nakayama Yoshio III. 5th lunar month of 1838: Tomijûrô moves to the Naka no Shibai, playing the roles of Yûshide and Kozue in the dramas "Karukaya Dôshin Tsukushi no Iezuto" and "Kajiwara Heizô Kôbai Tazuna". 9th lunar month of 1838: Tomijûrô plays the role of Kuzu-no-Ha in the drama "Ashiya Dôman Ôuchi Kagami", which is performed in the same theater. 11th lunar month of 1838: Tomijûrô takes part in the kaomise of the Kitagawa no Shibai in Kyôto. He plays the roles of Sagami and Otani in the dramas "Kumagai Jin'ya" and "Igagoe Dôchû Sugoroku". 1st lunar month of 1839: premiere at the Kado no Shibai of Nishizawa Ippô's drama "Keisei Hama no Masago"; Tomijûrô plays the roles of Gion-no-Okaji, the keisei Ishikawaya Masagoji and Otaki [casting]. He also plays the role of Masaoka in "Chiyo no Haru Hagi no Wakabae", a play with a script similar to the classic "Meiboku Sendai Hagi". 3rd lunar month of 1839: the play "Sesshû Gappô-ga-Tsuji" is staged for the first time in Ôsaka, at the Kado no Shibai; Tomijûrô plays the roles of Tamate Gozen and Irihei's wife Osode [casting]. He also plays the roles of Hinadori and Omiwa in the great drama "Imoseyama Onna Teikin". 8th lunar month of 1839: Tomijûrô plays the roles of Shimabara Kochô and Kozue in the dramas "Shimabara Zome Nanagusa Moyô" and "Kajiwara Heizô Kôbai Tazuna", which are produced in the same theater. 9th lunar month of 1839: Tomijûrô moves to the Naka no Shibai and plays 3 roles, including the famous role of Hangaku, in the drama "Wada Gassen Onna Maizuru". 11th lunar month of 1839: Tomijûrô and all the actors playing at the Naka no Shibai move to Kyôto. They perform at the Kitagawa no Shibai in the dramas "Keisei Sato no Funauta", "Wada Gassen Onna Maizuru", "Hirai Gonpachi", "Honchô Nijûshikô" and "Kuruwa Bunshô". 1st lunar month of 1840: Tomijûrô is back in Ôsaka, playing 4 roles in the drama "Keisei Setsugekka", which is produced by his disciple Nakamura Tomisuke at the Naka no Shibai. 3rd lunar month of 1840: Tomijûrô plays 4 roles in the drama "Futatsu Chôchô Kuruwa Nikki", which is performed in the same theater. 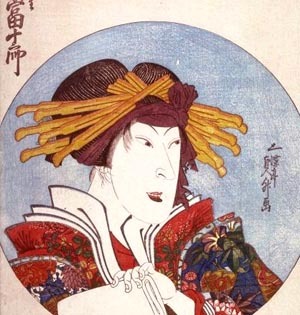 4th lunar month of 1841: Tomijûrô plays the role of the courtesan Yûgiri in the drama "Yûgiri Kuruwa Bunshô", which is performed at the Naka no Shibai. His stage partner in the role of Fujiya Izaemon is Ichikawa Danzô V.
1st lunar month of 1842: Tomijûrô performs in the same theater in the drama "Keisei Tsukushi no Tsumagoto" and the dance "Keisei Dôjôji". 3rd ~ 4th lunar months of 1842: Tomijûrô plays the roles of Ohatsu and Okon in the dramas "Kagamiyama Gonichi no Omokage" and "Ise Ondo Koi no Netaba". He also performs the main role of the dance "Keisei Dôjôji". 1843: Tomijûrô is victim of the repressive sumptuary laws which are directed at the Kabuki actors. He is expelled from Ôsaka and has to settle for a while in the port of Sakai. 11th lunar month of 1845: Tomijûrô is back in Kyôto and takes part in the kaomise of the Kitagawa no Shibai. He plays 5 roles in the drama "Ashiya Dôman Ôuchi Kagami". He also plays the roles of Sagami and Kiku-no-Mae in the drama "Ichi-no-Tani Futaba Gunki". 5th lunar month of 1846: Tomijûrô play the role of Oginoya Yaegiri in Chikamatsu Monzaemon's drama "Komochi Yamanba", which is performed in the same Theater. Spring 1847: tour in Ise (Furuichi Shibai). Summer 1847: tour in Nagoya (Tachibana no Shibai). 1st lunar month of 1849: his rank in the Kamigata hyôbanki is dai-goku-jô-jô-kichi (grand - extreme - superior - superior - excellent). 11th lunar month of 1849: Tomijûrô plays the roles of Shizuka Gozen and Osato in the michiyuki and the "Sushiya" scene of the play "Yoshitsune Senbon Zakura", which is performed at the Tachibana no Shibai in Nagoya. The roles of Yasuke and Tadanobu are played by Arashi Rikaku II. Tomijûrô also plays the role of the courtesan Akoya in the drama "Dan no Ura Kabuto Gunki". 1st lunar month of 1850: Tomijûrô plays for the last time the role of the courtesan Akoya in the drama "Dan no Ura Kabuto Gunki", which is performed in Sakai at the Minami no Shibai. 11th lunar month of 1851: Tomijûrô plays the role of Sodehagi in the drama "Ôshû Adachi-ga-Hara", which is produced in Kyôto at the Kitagawa no Shibai by the nadai Kameya Kumenojô and Hayagumo Chôdayû. His stage partners are Arashi Rikaku II (Abe no Munetô), Kataoka Ichizô I (Abe no Sadatô) and Jitsukawa Enzaburô I (Hachiman Tarô). 9th lunar month of 1853: Tomijûrô returns in Edo in the company of the tachiyaku Nakamura Nakazô III. He plays for the last time the role of Osono in the drama "Kana Kyodai Musume no Adachi", whose plot and structure are very similar to "Hikosan Gongen Chikai no Sukedachi", which is performed at the Ichimuraza. His stage partners in the roles of Rokusuke and Kyôgoku no Takumi are Arashi Kichisaburô III and Ôtani Tomoemon IV. 11th lunar month of 1853: Tomijûrô takes part in the Ichimuraza's kaomise, playing the roles of Shizuka Gozen and Owasa in the drama "Gosho Zakura Horikawa no Youchi". 11th lunar month of 1854: Tomijûrô plays the prestigious roles of Sodehagi and Omiwa in the dramas "Ôshû Adachi-ga-Hara" and "Imoseyama Onna Teikin", which are performed at the Ichimuraza. 1st lunar month of 1855: Tomijûrô returns in Kamigata but falls seriously ill.
13th day of the 2nd lunar month of 1855 : Tomijûrô dies. Great onnagata trained in the Kamigata acting traditions, Nakamura Tomijûrô II was also an excellent dancer and a renowned musician. His best roles were Omiwa ("Imoseyama Onna Teikin"), Masaoka ("Meiboku Sendai Hagi") Osono ("Hikosan Gongen Chikai no Sukedachi") and Akoya ("Dan no Ura Kabuto Gunki"). The 13th day of the 2nd lunar month of the 2nd year of the Ansei era was the 30th of March 1855 in the western calendar.